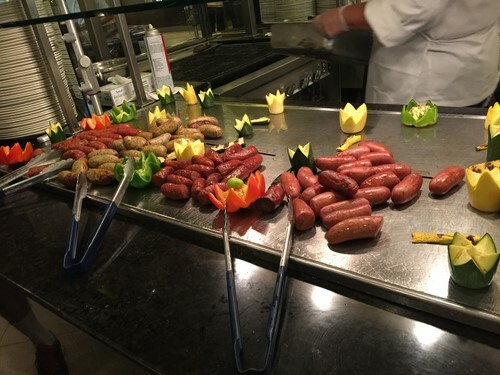 The The Buffet is a restaurant inside Pala Casino Resort and Spa in Pala, California. THE ONLY THING THAT I DON'T LIKE ABOUT THIS PLACE IS THAT THEY DON'T OFFER CHILDREN'S PRICES. I HAVE TO TAKE MY GRANDCHILDREN TO PECHANGA TWICE A MONTH DURING THE SUMMER AND ONCE A MONTH DURING THE SCHOOL YEAR. ALL NINE OF THEM LOVE PALA BUFFET MORE BUT THEY ONLY GET TO GO ONCE A YEAR DUE TO THE PRICES. THEY LOVE YOUR CRAB AND LOBSTER. Great buffet and great all-you-can-eat lobster buffet (Canadian tails and Maine lobsters) on Tuesday and Thursdays! Mongolian BBQ, Pasta Chef, BBQ ribs, carving station, great sides, salad & fruit bar, and wonderful Asian, Italian and Mexican stations. The dessert station has yummy ice cream choices, even the Filipino specialty, Halo-Halo! Something gave me a weird feeling of rapid heart rate and bad gas. Either the food or the water. Really bad Birthday 🎂 Dinner. The previous 3 we're good but this last visit only got two stars because I got a twenty dollar birthday voucher. No different than any other casino buffet. Same food you see at any of them. The service was good for getting your drinks and taking plates. The line to get in was absolutely excruciating though. Lots of choices, some better than others. Amazing desserts, abundant seafood. Wait staff very attentive. Bring your own cocktail fork for the crab legs. I’m torn up about this one. If you come alone, without your kids, it’s easily 4 stars. The food is good and there are plenty of options. If you bring your kids you might be tempted to turn around and leave when I see that they do not offer children’s prices. They charged FULL PRICE for my 18 MONTH OLD!!!!! My 12 year old I’m not upset about because they can eat just like an adult. We won’t be back. Too far and too expensive. Probably try the Pechanga buffet next time, at least they have children’s pricing.